Custom Building Your Next Motorcycle. Have you ever thought of custom building your next motorcycle? The majority of motorcycle riders are satisfied with riding a Harley Davidson, BMW, Ducati, Honda or some other major brand of motorcycle. However there is a select group of mechanical minded folks that want to build their own motorcycle. I was reminded of this topic when I saw this motorcycle on a recent trip to town. 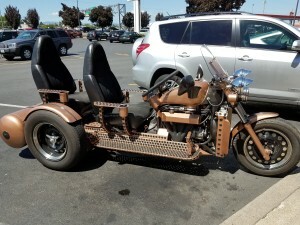 As you can see, this is a unique style of motorcycle. A person will either love it or hate it. Rules to make your motorcycle street legal. A white headlight illuminated at all times. Motorcycles must have at least one, but not more than three, white headlights. Modulating headlights are allowed during daylight hours. At least one red taillight with a red stop lamp. At least one red reflector on the rear, one white license plate light, one rear-view mirror and a horn. Turn signal lights. Motorcycles built before 1973 are not required to have turn signal lights, however, vehicles without turn signal lights may not be operated after dark. At least one brake operated by hand or foot. An exhaust system in good working order and in constant operation. The exhaust must prevent the discharge of any visible emissions and keep noise levels at or below standards set by the Department of Environmental Quality. It’s helpful to have a garage or work area to take on the project. To keep you motivated and for the help of an extra set of hands, we recommend a good buddy. Take lots of pictures of the build so that you can see how far you have come. So show off your skills, install your Crampbuster on the throttle and enjoy the ride!